When faced with complex challenges or uncertain outcomes, many leaders believe that if they are smart enough, work hard enough, or turn to the best management tools, they will be able to find the right answer, predict and plan for the future, and break down tasks to produce controllable outcomes. But, what are leaders to do when this isn’t the case? In complex situations, prediction, control, and the right answer are illusions. 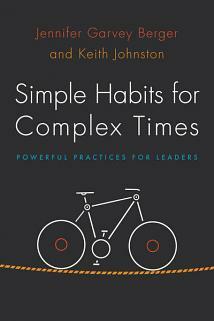 Rather than offering one-size-fits-all tips and tricks in pursuit of these mirages, Simple Habits for Complex Times provides three integral practices that enable leaders to navigate the unknown. By taking multiple perspectives, asking different questions, and seeing more of their system, leaders can better understand themselves, their roles, and the world around them. They can become more nimble, respond with agility, and guide their organizations to thrive in an ever-shifting business landscape. The more leaders use these simple habits, the more they enhance their performance and solve increasingly common, sticky business issues with greater acumen.